Upgrade! There have been a number of fixes and upgrades to the site whilst it was in the process of being migrated from the old server. Which one is your favourite? As you know I've been on serious painkillers whilst recuperating from a leg operation, so I haven't felt very chatty. I have, however, had lots of time to code. The site is now coded to the latest PHP Coding Standards which was a bit of task with 13 years of code to go though, and split into Model–view–controller which was actually impossible with PHP3 but de rigueur today. Anyway.. 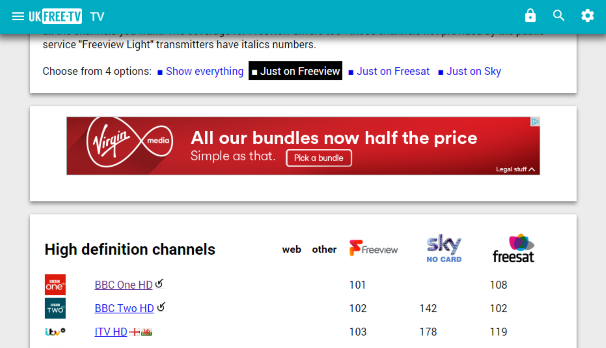 The all channels list now has a useful submenu where you can filter the list to show the channels that are just on Freeview, just on non-subscribe Sky and just on Freesat. Something I did a long time ago: there is a Personal Computer World index 1981-1998. 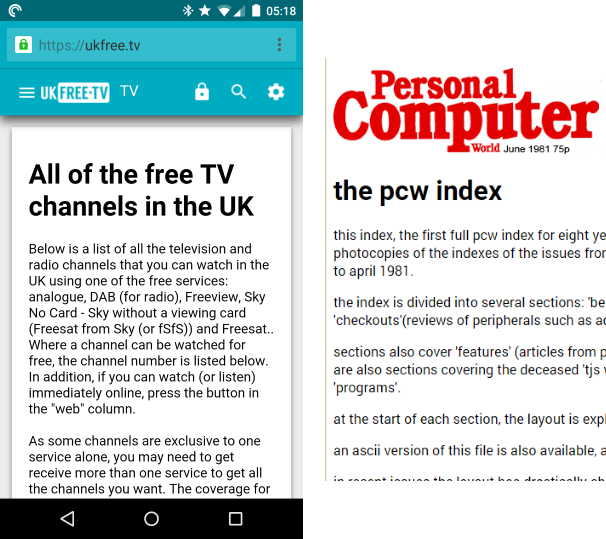 The pages that show the different TV and raidio stations in a way that allows you to compare say Freeview Light and Freesat has a menu once again. You can also see the Defunct Channels List too. If you use Google Earth and would like to see all of the Freeview transmitters on it, you can click on this link to download a KML file to do that. This is in addition to using the Google Earth link on many of the transmitter pages. On the TV prediction page there is a now a much improved TV full details page. The layout is clearer and it works even on a mobile phone. You can still choose dates in the past when things changed, as well as finding out what the difference between a wideband and a grouped (A, B, C/D, E or K) will make to your TV reception. In addition you can sort the list by clicking on one of the headings (channel, name, signal strength, direction, transmitter). 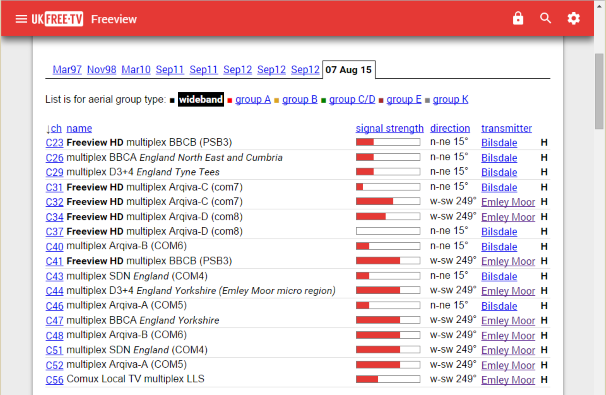 On the pages that map the BBC, ITV and micro Freeview regions, the layout has much improved. It is now possible to use these selectors with a finger press. 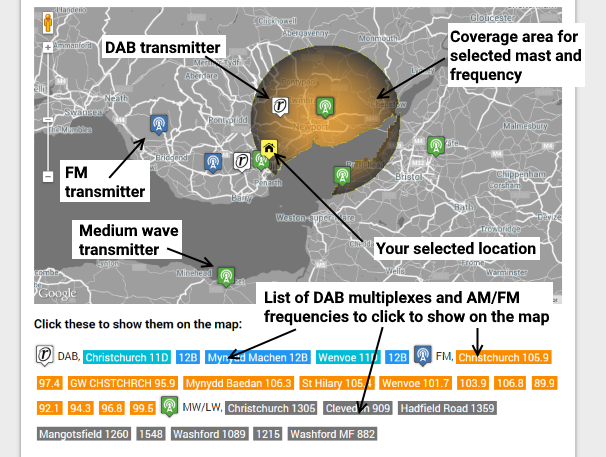 And don't forget the new Radio Prediction and mapping system! Of course, if there is anything that doesn't work for you, let me know. the page reloads and always shows 'Show everything'? I've tested it with Windows 7 and Windows 10.
as 'Just on Freeview' shows all the Com multiplexes' that are not available. You could also add a tick box to display or hide the HD channels and channels like Film 4 SD that requires a HD box. 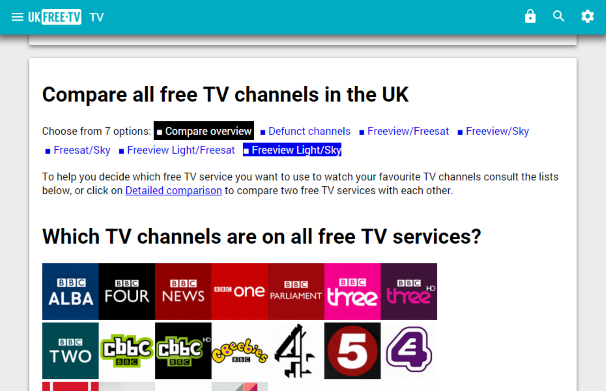 Mark A: When I look at All of the free TV channels on Freeview in the UK it says "All of the free TV channels on Freeview in the UK" and lists only those on Freeview, and none that are only on Sky/Freesat.On all these lists those on Freeview Light only are in normal text with those only on Full Freeview are in italics. Is that too subtle?And the HD channels are all listed separated out at the top of the page. 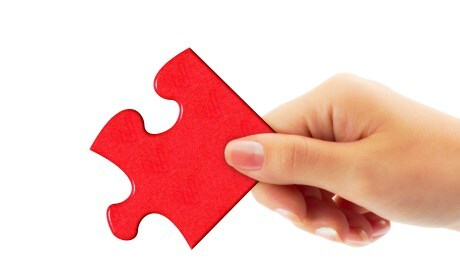 Just testing the faster-redirect after posting comment. hi just puchased a ferguson hd 100 free sat reciever, I have the silvercrest hd reciever with restricted channels whilest abroad. can i use the ferguson free sat to obtain UK tv in france..